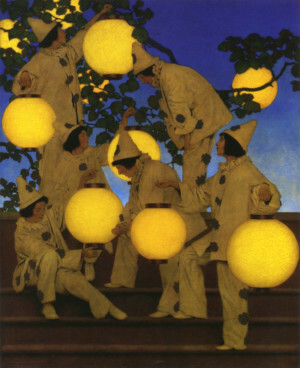 Maxfield Parrish (1870-1966), The Lantern Bearers, 1908. Bentonville, Arkansas, 2006.71. Photography by Dwight Primiano. Stockbridge, MA, May 9, 2018—This summer, the Norman Rockwell Museum presents the first comprehensive exhibition to look at the work of master illustrators Maxfield Parrish, N.C. Wyeth, and Norman Rockwell in relation to the history of Western art. With more than 60 works by 25 American and European painters, along with more than 300 digital representations of some 50 other artists, Keepers of the Flame: Parrish, Wyeth, Rockwell, and the Narrative Tradition will reveal the lineage connecting American illustration to some 500 years of European painting through the long line of teachers who have passed along their wisdom, knowledge, and techniques to generations of creators. Organized by the Norman Rockwell Museum, the exhibition is on view from June 9 through October 28, 2018. It is curated by Dennis Nolan, an award- winning artist and professor of illustration at Hartford Art School, University of Hartford. Keepers of the Flame traces the student-to-teacher lineage of Parrish (1870–1966), Wyeth (1882–1945), and Rockwell (1894–1978)—among the most recognized narrative-picture makers of the past century—to their artistic forbears reaching back to the Italian Renaissance. In so doing, it shows how these illustrators, all of whom painted with the same principals and techniques as their artistic ancestors — including a focus on the human figure, convincingly placed in space, atmospheric effects, and other illusionistic devices—created what would prove to be iconic imagery and unforgettable narratives that defined them as keepers of the flame of traditional Western painting. The exhibition occupies four galleries, the first of which is devoted to Maxfield Parrish and his forebears. This will include the artist’s Enchantment (Cinderella) (1914), shown next to Reverie, a 1912 work by Robert Vonnoh (1858–1933), one of the artists under whom Parrish honed his drawing and painting skills. Parrish’s intriguing and beautiful Lantern Bearers (1908) depicts a scene drawn entirely from the artist’s imagination. Indeed, with their fairytale-like mood, costumed figures, and saturated colors, scenes like these set Parrish apart from his contemporaries, but link him to such earlier works as The Language of the Fan (1882) by Jules-Joseph Lefebvre (1836–1912) and Young Love (1889) by William Bouguereau (1825–1905) both on view in this gallery. Parrish’s artistic heritage is also represented here by paintings by his teacher Thomas Anshutz (1851–1912), and Anshutz’s teacher, the great Thomas Eakins (1844– 1916); by Eakins’s teacher, Academician Jean-Léon Gérôme (1824–1904), and, in turn, by Gérôme’s teacher Paul Delaroche (1797–1856), among others. The following gallery focuses on N.C. Wyeth, one of the most successful illustrators of his day, and the patriarch of a family of artists. Evident in this gallery is the way in which, like his primary teacher, Howard Pyle (1853–1911), Wyeth looked carefully at the history of art. His In the Crystal Depths (1906), for example, a powerful composition in which a Native American, canoeing between massive cliff faces, looks at his reflection in the still, crystal-clear water, shows nature to be at once peaceful and awe-inspiring, and it is reminiscent of both German Symbolism and 19th- century American landscape painting. In another nod to the history of art, Wyeth’s So the child was delivered unto Merlin, and so he bare it forth (1917), also on view, harks back to the pre-Raphaelite era, as does Pyle’s nearby The Wicket of Paradise (1902). Other works here include Pyle’s A Dream of Young Summer (1901), showing how he brings life and movement into his work, and paintings by his teacher Lemuel Wilmarth (1835–1918), whose genre scene A Sailor’s Return (1884) contrasts with his teacher Jean-Léon Gérome’s history painting of Moilère and Louis XIV (1862), and, in turn, Gérôme’s teacher Paul Delaroche’s Napoleon Crossing the Alps (1848). Norman Rockwell, the youngest and perhaps best known of the three illustrators, is the subject of the third gallery, where a range of his work and examples of others is on view. Rockwell’s Girl at Mirror (1954) belongs to a long tradition of paintings of women contemplating their reflection. Here, however, in a masterful depiction of the in-betweenness of early adolescence, the subject is an everyday girl holding a fan magazine. She poses in front of the mirror as if to try on a new, more grown-up identity, while beside her are lipstick and a hairbrush and, just a bit further away, a child’s doll. Also in this gallery is Rockwell’s dynamic composition titled Heart’s Dearest Why Do You Cry? (1938), depicting a glimpse of an encounter between a man and woman on a rainy street as a passerby rushes past them, his head already out of the picture frame. It is shown next to Henri Lehmann’s (1814–1882) The Adoration of the Magi (1854), an earlier example of a complex, multi- figure scene. Examples of work by Rockwell’s teachers Thomas Fogarty (1873–1938) and George Bridgman (1865–1943) are also on view here, with work by their teachers in turn, including Henry Siddons Mowbray’s (1858–1928) flower filled fantasy, Rose Harvest (1887), Gustave Boulanger’s (1824–1888) painting from his travels in Morocco, Arab and Hound (1868), and Gérôme’s Young Greeks in the Mosque (1865). The final gallery of Keepers of the Flame sums up some of the exhibition’s major themes. A wall of historic preparatory drawings shows a variety of artists—from the 18th-century Nicolas Bernard Lépicié (1735–1784), to Charles Bargue (1826–1883) and George Bridgman— honing their drawing skills, with a focus on drawing the human figure in space. Another wall exhibits works by Parrish, Wyeth, and Rockwell, along with examples drawn from the tradition which they maintained, including a Madonna by Florentine painter Lorenzo di Bicci (1350–1427) and paintings by Carle Van Loo (1705–1765), Pierre-Narcisse Guérin (1774–1833), and Jean-Leon Gérôme. Finally, this gallery houses an interactive display that fills out the family tree of the student/teacher lineage with selected paintings by and portraits and biographies of more than 70 artists representing five centuries of visual storytelling, from Lorenzo di Bicci, Fra Filippo Lippi (1406–1469), Sandro Botticelli (1445–1510) and Leonardo da Vinci (1452–1519) to Parrish, Wyeth, and Rockwell. Artwork from 1400 to the mid-1960s will be further documented in the richly illustrated exhibition catalogue, which includes essays by Nolan; Norman Rockwell Museum trustee, educator and historian Alice A. Carter; and Norman Rockwell Museum Chief Curator Stephanie Plunkett. A members’ opening event for Keepers of the Flame will be held at the Museum on Saturday, July 14, from 5:30 to 7:30 p.m., with commentary by exhibition curator Dennis Nolan at 6 p.m. The event is free for members, $25 for not-yet members. Keepers of the Flame is sponsored in part by Dena M. Hardymon, TD Bank, and the Dr. Robert C. & Tina Sohn Foundation.